Understanding fan and shroud combinations can often be the most difficult part of researching radiator, shroud, and fan packages for your vehicle. We have done our best to make navigating our Fan and Shroud options as easy as possible. Here are a couple of basic things you need to understand about fans before making a cooling package decision. Aluminum OEM style fan shrouds for mechanically driven fans. Pros: Replicated the original shroud design for many vehicle in durable aluminum. Cons: Mechanical fans may not produce enough air flow to cool many modified or high horsepower application compared to electric fan and shroud packages . Bracket mounted fans is our simplest configuration for an electric fan set up. As the name implies, this set up uses simple brackets to mount a fan against the radiator core. Pros: This package is very thin and will fit in many applications where available space is limited on the engine side of the radiator for a "puller fan" set up. Also, bracket mounted fans are the only viable option for grill side "pusher" fan set ups, that allow air flow. Cons: Because the fans are only mounted on a bracket and no shrouding is applied, the fans will only create air flow on the radiator core surface area directly in front of the fan when in use and will not utilize the complete radiator core. 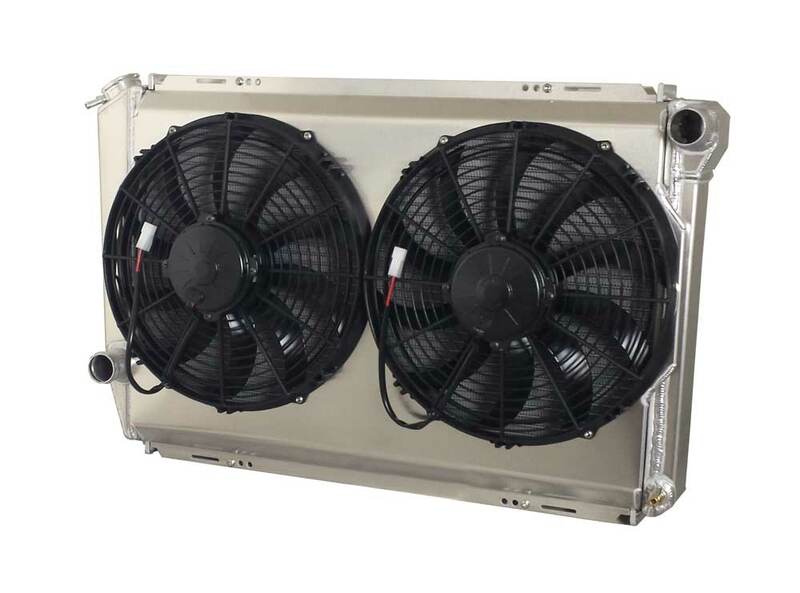 An integrated Fan shroud is a unique fan shroud that was developed by Wizard Cooling. This fan shroud allows us to mount the fan(s) inside the shroud, using a motor riser and motor cover to support the fan. Pros: This package is very thin and will fit in many applications where available space is limited on the engine side of the radiator for a "puller fan" set up. It also allows to create airflow across the whole surface of the radiator core, which is important in high Horsepower applications, where limited space is available. It is an improvement over simple Bracket Mounted fan(s). Cons: Because the fan(s) are mounted inside the shroud, some air flow efficiency is lost due to the placement and mounting of the fans inside the shroud. A traditional or Non-Integrated Shroud is the most common type of shroud and is also the most efficient shroud for creating air flow across the complete radiator core; creating the best cooling application for an electric fan set up. The fans are mounted externally on the shroud. and the shroud encloses the entire surface area of the radiator core. This is our most recommended electric fan shroud set up for most applications. Pros: Because the shroud encloses the entire surface area of the radiator core, air can flow through the entire surface area of the core, greatly increasing the radiator's effectiveness as there are no dead zones where the core working to transfer heat. The CFM rating that you see on fan marketing materials is assigned to each fan at zero static pressure. What that means is that that is the amount of air the fan moves when it is held up to thin air (not up against a radiator). There are also different diameter of fans as well as different thicknesses of fans. Selecting the diameter of your fan is the easy part. It will be determined by the radiator you have. Selecting the correct fan thickness will need careful measurement, consideration and thought. The thinner the profile the smaller (thinner) the fan motor, the less air it will move at zero static pressure. The thicker the fan diameter, the bigger, and stronger the motor will be. The more rows of tubes and fins you have, as well as the higher the fin count on our high performance cores, gives Wizard Cooling radiators more potential to cool your motor. Upgrading a radiator's cooling capacity with thicker and more dense cores can, in turn, cause airflow resistance, preventing sufficient airflow through the core of your radiator. This is important to consider, particularly in performance applications, where we are using very dense and thick aluminum cores. All these factors will impact your choice of fan and shroud options as well as your overall package thickness. It is also important to keep in mind that if you add any coolers in front of the radiator; like A/C condensers, oil coolers, charge air coolers. You are increase the airflow resistance. In order to insure that your cooling system is working at peek performance it is important to select the fans based on the amount of resistance that exist in your application. To help navigate our different cooling packages, please view the chart below, which will outline our recommended fan and shroud packages for different radiator applications and configurations. The most important "fit" factor before purchasing a complete Wizard Cooling package (radiator, fan and shroud) is understanding how thick your whole package is. In most applications, that will require you to know the amount of room between your core support and your motor. 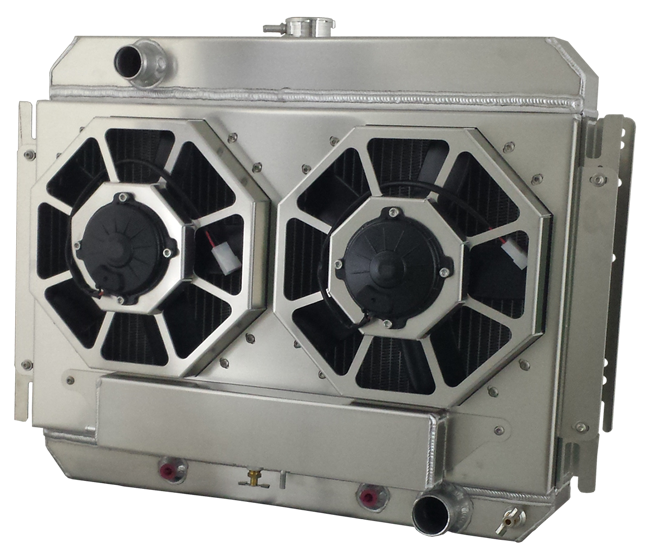 You may not always have enough room for the ideal package in your application, but we guarantee that we have the best cooling solution on the market that will physically fit in the space you have allotted for the cooling system. The chart above will help when pairing the right fan package with your radiator. Wiring your electirc fan package yourself can be very easy. You'll need to use one or two Fan Wirting Harness/Kit to wire your fans and depending on the fan(s) you'll be using. Then you can simply follow the instructions provided by the electric fan manufacture. You can find easy to use PDF instructions for both Spal and Maradyne Fan wiring in the PDF containers below. If you have questions after reviewing this page, please visit our FAQ or feel free to call us or e-mail us through our "Contact Us" page.